The man signed to spearhead Whitby Town’s forward line for the upcoming season has promised Blues fans goals – and lots of them. Mikey Roberts arrived at the Turnbull Ground last month after a mystery donor stumped up the cash to pave the way for his transfer from Spennymoor Town. And since pulling on a blue shirt, the 24-year-old has displayed the Midas touch, netting five times in just six pre-season games. 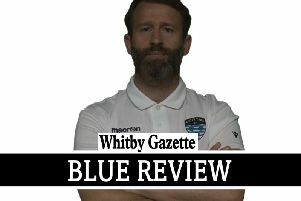 “I’m pleased that I’ve hit the ground running and managed to score a few early on,” Roberts told the Whitby Gazette. “I’ve been brought in to score goals and I’m confident of doing that. “I stepped up a level last season and although it took me a little bit of time to adjust, I feel I produced in front of goal. Roberts registered 20 times for Evo-Stik Division One North Spennymoor last term after scoring more than 80 goals for Guisborough Town over five seasons – exploits that saw scouts from Premier League Crystal Palace monitoring his form. Unsurprisingly, Whitby were just one of a host of clubs interested in securing his services for the new campaign, but Roberts revealed that it was an easy decision to sign for the Blues after just one conversation with boss Darren Williams. “What the manager said to me when we spoke was one of the main reasons I signed for Whitby – what Darren told me was what I wanted to hear,” Roberts added. “I put the fact that I’ve settled so quickly and already scored a few goals down to the gaffer showing that he believes in me. “Having the confidence of your manager is a big thing for me personally. Roberts says that he has been made to feel immediately at home at the Turnbull, something aided by the fact that he was already friendly with a number of the other members of the Town squad. “This is the quickest I have ever settled in at any club,” he continued. “I knew Callum Martin and Adam Gell from Guisborough and I am mates with a few of the other players, which obviously helped. “But the big thing is the fact that I’ve really been enjoying myself here.